This version was probably the most advanced CD-I model ever made since it had to be shrinked a lot! 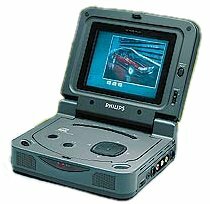 Made for people constantly on-the-road and for businessman that wanted to present everywere their CD-I based presentations, was so expensive that had to be ordered specifically: it wasn't widely available in shops! This model was designed together with Sony that showed a prototype with thier logo on it long time before Philips began to distribute it. A/V output connections: CVBS output (cinch), S-Video output (miniDin), Audio output (2 x cinch), Headphone (3.5 mm stereo jack), A/V input connections (miniDin). 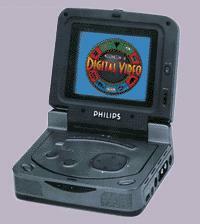 A portable professional platform based on state-of-the-art CD-i technology. With its built-in Digital Video decoder and rich variety of interfaces, the CDI370 is a powerful tool for boardroom, sales, service and educational applications. Thanks to Draven1 for giving me some interesting addresses.